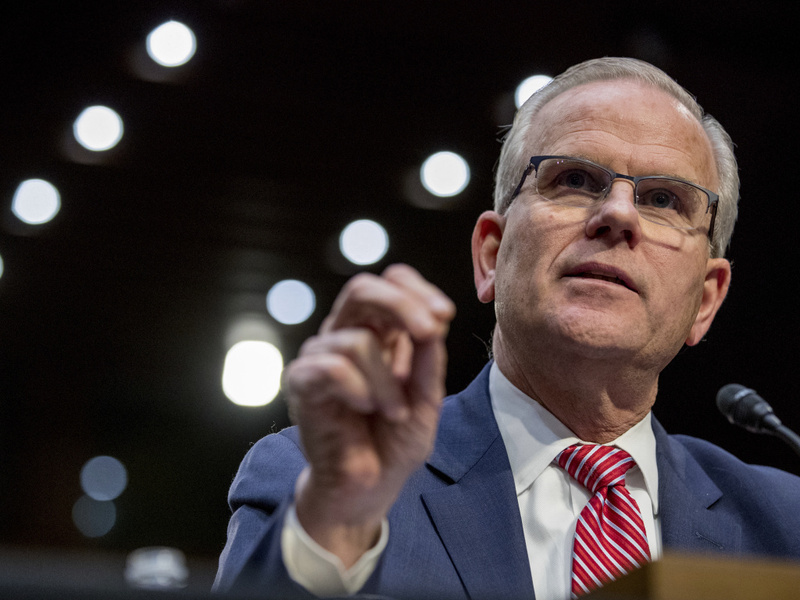 At a Senate hearing March 27, Daniel Elwell, acting director of the Federal Aviation Administration, said airline pilots had enough training to handle Boeing's flight control software. But some pilots disagree. Investigators are still piecing together what happened in the deadly crashes of a Lion Air flight in October and an Ethiopian Airlines flight last month, but this much is known: In both cases, the Boeing 737 Max planes crashed minutes after takeoff and after pilots appeared to struggle to control their planes. They did not seem to know how to handle a system, called MCAS, that was forcing their planes into a nosedive. At a hearing last week, Sen. Ted Cruz, R-Texas, chairman of the aviation subcommittee of the Senate commerce committee, pressed for answers from Daniel Elwell, the acting chief of the Federal Aviation Administration. "There's nothing in the pilot training about the MCAS system adjusting the nose of the plane downward and how to compensate for that in the event of a malfunctioning sensor," Cruz said. "Is that accurate, that the training does not include that?" "Senator, I would actually say that it is accounted for in the training," Elwell replied. He went on to say that the real problem the 737 Max pilots faced was something called runaway pitch trim. That problem concerns the pitch, or angle of the plane's nose in the air. Every aircraft has systems for adjusting pitch. When a plane is cruising it is usually controlled by autopilot. But pilots are trained to take over and fly the plane manually if the pitch trim system is out of control. Elwell emphasized that all pilots should know how to do that. "You're not fumbling through books; it's a time-critical procedure, and you go to that," he told lawmakers. The 737 Max is different, though. Boeing installed a software program called MCAS, short for Maneuvering Characteristics Augmentation System. It's meant to help pilots prevent a stall by pushing the nose of the plane down if it senses the plane is flying at too steep of an angle. Pilots can override MCAS. But a lot of pilots say they didn't know the software existed until after the Lion Air crash. They say the manual did not explain it or provide explicit instructions on how to disable it. Capt. Jason Goldberg, who flies for American Airlines and is a spokesman for its union, the Allied Pilots Association, disagrees that pilots got enough training to handle MCAS. "I hate to be in a position to contradict acting Director Elwell, but in this case the statement is not correct," Goldberg says. Goldberg says it's true that pilots train to overcome pitch trim problems, so they can get the plane's nose flying at the correct angle if the system goes haywire. But an MCAS malfunction on a Boeing 737 Max creates a host of other problems, and they're all distracting. "You would have the stick shaker, which [activates] a rather violent aggressive shaking of the control column," Goldberg says. "You would have the appearance of unreliable airspeed. You would have a number of warnings that don't immediately or intuitively give the impression of a pitch trim problem." MCAS seems to have baffled pilots in the two crashes. The Lion Air pilots reportedly flipped through a manual looking for answers before their plane crashed, killing all onboard. A spokesperson for the Air Line Pilots Association of Ethiopia told NPR there was nothing in the training to prepare pilots for the situation they faced. Ethiopian Airlines says it has a simulator for the 737 Max 8, but the pilots association said there was no setting for an MCAS scenario. Boeing has not confirmed that claim. Even among pilots of major U.S. airlines, Elwell has triggered a stark difference of opinion. "We have been trained on how to handle the mishap that occurred in at least the Lion Air jet that we know about," says James Belton, a United Airlines pilot and spokesman for the Air Line Pilots Association. Belton says the manual described how a 737 Max will respond in the kind of scenario that would trigger MCAS, even if it did not name the software outright. Further, he says the FAA issued a directive after the Lion Air crash that provided clearer instructions. Belton says U.S. airlines have flown the 737 Max for more than 100,000 hours, including some 23,000 hours at United, without a problem. "I can't really comment as to the training that they get overseas, but I know here in America ... we have not seen one data point saying that we had a performance or a maintenance issue with it," he says. Belton says that clean record is a testament to rigorous U.S. standards. In most cases in the U.S., both the captain and the first officer — the copilot — need at least 1,500 hours of flight experience. Overseas, first officers might have as little as 250 hours. On the Ethiopian Airlines flight that crashed, the captain had 8,100 hours of flight time but the first officer had 350 hours, according to the airline. Elwell's claim that pilots were prepared for the MCAS has raised eyebrows among some training experts. "I find it surprising that a system that affects the pitch control of an aircraft of any description is not brought to the attention of the people that are going to be flying it," says Dai Whittingham, chief executive of the United Kingdom Flight Safety Committee. The group promotes commercial air safety and counts British Airways, Virgin Atlantic and Ryanair among its members. Whittingham says that pointing to the pilots' training as a possible reason for the two crashes is "deflecting responsibility from where it properly lies" — with Boeing and the FAA. He says he believes U.S. pilots were just as vulnerable to an MCAS malfunction as their overseas counterparts. "I think it would have been possible for an American pilot to have crashed the 737 Max if they had not been able to diagnose the problem," Whittingham says. Goldberg at American Airlines says it's not training alone that accounts for his safe experience flying the Max. He says his airline paid extra for additional safety equipment that helped pilots keep a closer eye on the information feeding into the MCAS system. Boeing says those safety features will be standard on every 737 Max, and the company will provide extra pilot training. The company is also adjusting the MCAS software to be easier to override. On Wednesday, Boeing announced that CEO Dennis Muilenburg joined the company's test pilots on a 737 Max 7 flight to show how the updated MCAS software works. The manufacturer says it will run more tests and demonstration flights as it develops its software. "Safety is our first priority, and we will take a thorough and disciplined approach to the development and testing of the update to ensure we take the time to get it right," Boeing said in a statement. Both Boeing and the FAA say the fix needs more time before the planes can fly again. For now, the 737 Max fleet continues to be grounded.